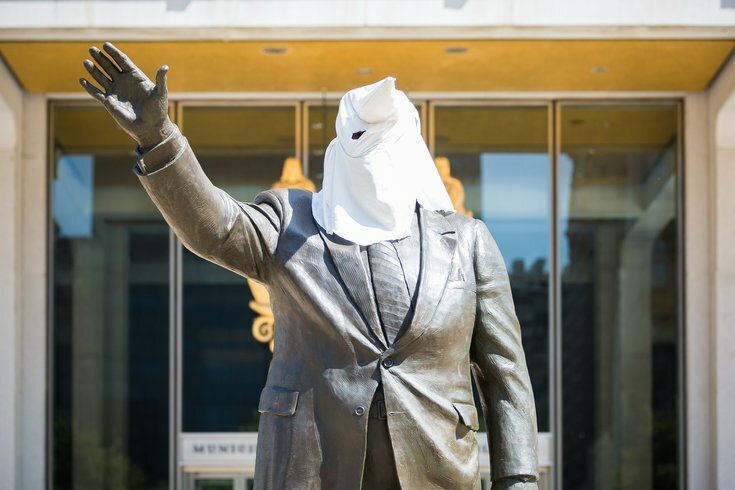 Black Lives Matter activists covered the head of the Frank Rizzo with a white hood on Aug. 12, 2016. On Monday night, protesters toppled the “The Boys Who Wore The Gray” Confederate statue in Durham, N.C. The symbolic move came two days after a deadly clash in Charlottesville, Va. which was ostensibly prompted by the proposed removal of a statue of Confederate Gen. Robert E. Lee. Though Philadelphians watched those events from afar, the issue arrived in the city shortly after the Durham statue fell – and a 25-word Tweet by city Councilwoman-at-large Helen Gym. On Tuesday, Gym told PhillyVoice that this isn’t an isolated call related to the statue of the late Mayor Frank Rizzo’s statue outside the Municipal Services Building in Center City, but one that falls in line with her “larger body of work” touching on “fixing a broken justice system,” improving education and, among other issues, rallying for pay equity. “I just think that it’s time. It’s time to have these conversations,” she said. “We’re going to embark on a public process, and there are a number of agencies that can be the vehicle for that. I’d like it to be an effort that unifies people, confronts racism and the wounds of racism that are deeply embedded in Philadelphia’s past. Lauren Hitt, spokeswoman for Mayor Jim Kenney, concurred with Gym's message. Their words represent a timely call to arms, but one that prompted a heated discussion between Rizzo’s grandson and Black Lives Matters activists just over a year ago. At that August 12, 2016 protest, protesters placed a Ku Klux Klan hood over Rizzo’s head and declared a mission to “tear down” the statue. Rizzo’s grandson, Joe Mastronardo, saw footage of the protest via social media and called me on the scene, asking to speak with Asa Khalif, the Black Lives Matter Pennsylvania activist who organized the protest. 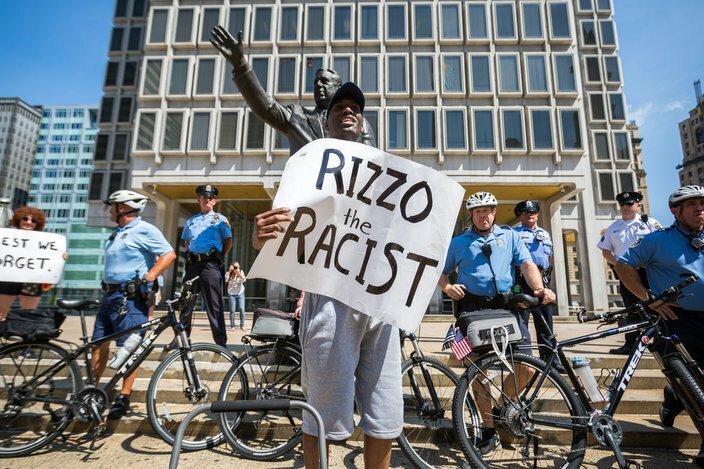 Black Lives Matter activist Asa Khalif organized the protest of the Frank Rizzo statue at Philadelphia's Municipal Services building on Friday, Aug. 12. Suffice it to say, it was not a friendly conversation. 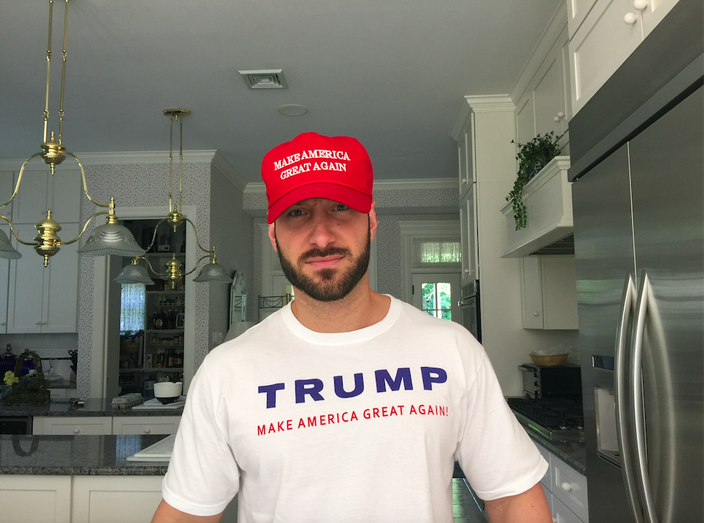 Joe Mastronardo, grandson of late Philadelphia Mayor Frank Rizzo, is a staunch Donald Trump supporter. On Tuesday, both men reacted to the call by an elected official for the statue’s removal. Minutes after confronting Jack Drummond – director of the city’s Office of Black Male Engagement – regarding the David Jones case, Khalif didn’t seem to be all that willing to wait for an extended public process regarding the statue. In fact, he said plans are already in the works to tear the statue down. He noted that politicians may feel more comfortable broaching it after the “Charlottesville massacre,” including the same ones who didn’t respond to his calls after last year’s protest. While he isn’t necessarily looking to destroy it, Khalif said that’ll be the result if the process doesn’t move along quickly enough. “Get it off city property. Put it in a museum. Put it at his son’s house. Just get it the f*** out of plain view. Replace it with Rocky. I don’t give a f***,” he said. “There has to be some show of force now. (The statue) represents generations of hurt and racism. For his part, Mastronardo wrote the issue off as "the same bulls*** as last year" and emblematic of leftists "always playing the race card when that's all they have left." He also deemed BLM "a domestic radical terrorist group." "They just want to go start another riot. That's what they want to do," he said. "The whole thing is ridiculous. They just want to go down there and put people in harm's way. People will show up on the other side when they hear this is happening. When there's action from one side, there tends to be a reaction from the other." He sounded resigned to the fact that the protesters could take down the statue of a man who, to Mastronardo, was nothing like he's being presented. "They're going to do what they're going to do," he said. "Hopefully, they'll be prosecuted to the highest extent of the law."